This week we are up to #35 of Gourmet's List of 50 Women Game Changers. Mary from One Perfect Bite started a group of bloggers to post recipes each Friday and this week we are featuring Delia Smith. Delia is Britain's top selling cookbook author and television host. I have to admit that I was unaware of her which is one of the reasons I'm so glad that I joined this group. I've learned a lot. I chose to make this recipe because every time I went to her site for recipes (and there are many) this one somehow came up. Today I looked under What Should you be cooking this month? and this one appeared. Once I made a trip to the market and started chopping, it came together very quickly. It needs to cook for 15 minutes and then an additional 20 after you add the milk and chicken broth. The vegetables become very soft and it was quite easy to use my immersion blender to get it to a very smooth consistency. Adding the creme fraiche and fresh chives...delicious. Easy, inexpensive...I will be looking for more recipes of Delia Smith's. Have you tried any? This looks delicious. So nice to see someone else knowing of Delia. I received two of her cookbooks some 15 years ago from a British friend and have loved them. I am a soup fanatic all winter long, this looks soooooo good!! Creme Fraiche is the perfect topper, this I must try! i have not tried her recipes annie. but i adore julia childs potato leek soup. it is my all time favorite soup. have a wonderful weekend! YUM! 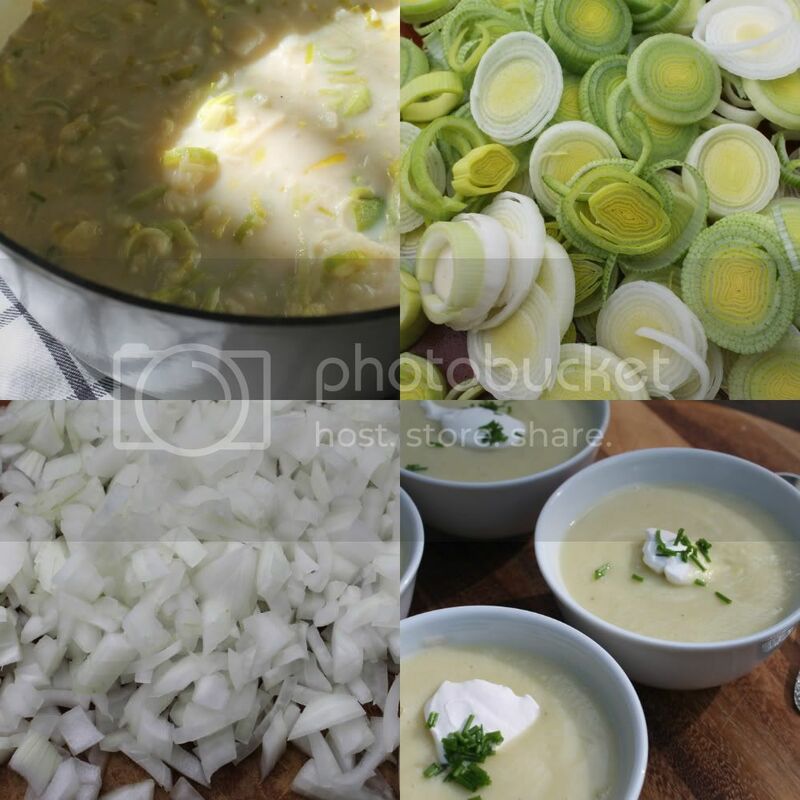 I love leek and potato soup, it's one of my favorites. Your photos make me want to grab a spoon and dig in! This soup is perfect for this time of the year. I have been enthralled with Julia since I was a teenager but I must admit to never making many of her recipes. I think it is the whole conversion thing. Hi Annie! This soup looks delish! I love pureed soups as well. I made a white bean soup this past week that was broth based and it was terrible, all I could taste was the onions. My husband loved it, but I realize I like a good purred soup and I actually like using my vitamix more than my immersion blender. The soup gets so much more creamier in the blender. BTW, my girlfriend and her whole family loved your stew recipe. Looks delicious Annie! What did you use for the potatoes? I saw that she called for pre-made mashed potatoes, I've never tried them before. This sounds great, looks like Delia was great at making soups!